A town in which a minutes' encounter is a sufficient reason to great each other for life. The beginning of holidays, impossibility of travelling, boredom. 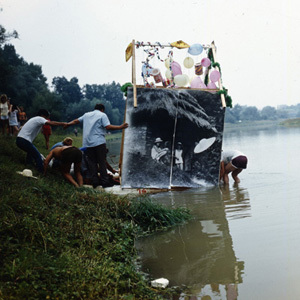 At that period the river of Laborec changed into the Humenne riviera. Floating of the unusual vessels was ranked amongst the climax of summer. Its regular participant and a double winner was Marian Kusik, the man with whom I also attended the last rafting as a twelve year old. 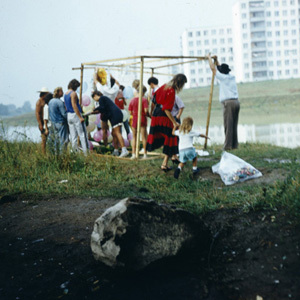 Childhood Dream was a community housing estate project created according to the concept of Marian Kusik in 1988. The idea itself was born in a pub. A man sitting next to Marian taunted him, saying what kind of photographer is he who gives his photos away? His friend built a house from the profits of his photo orders. The entire preparation lasted several months. They had to order photographic paper, chemicals, muster together the photographic equipment, large-scale bowls and not least, the space where the two meter high photos could be enlarged, washed and dried. My mum arranged the use of a laundrette, dad helped to muster up big bowls used to stir the concrete in which we diluted the chemicals and several other neighbours assisted with the whole process. Someone gathered wood for the house skeleton, a water bicycle was arranged. We moved the furniture in our flat out of the way so as to dry huge photos. Even after all these years I can't help feeling the process of making was a much greater experience for me than the rafting itself. It rained on that day, I was worried about the dog that sailed with us and I lost my heart shaped glasses. I didn't like the photos which are of me and my sister. I didn't feel good in the role as a model. I perceive the performance itself as a document of the era which remains thanks to Marian very well documented. 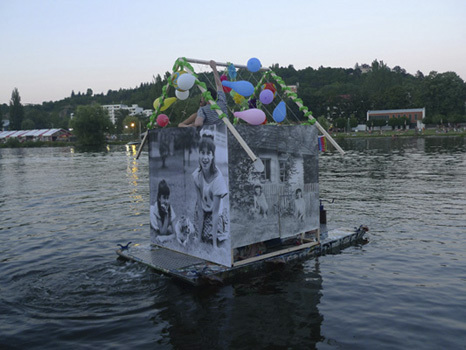 We decided, as part of the exhibition Heat, to reconstruct the vessel in the MeetFactory gallery and on the day of the opening float it on Vltava river, not far from the gallery. 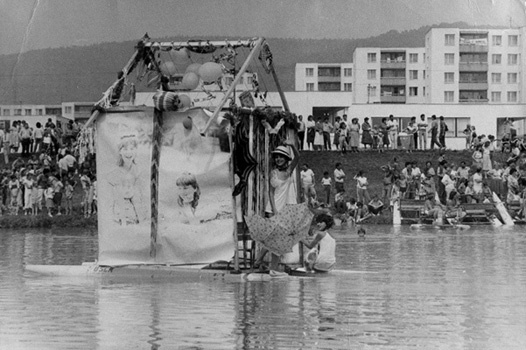 The presence of the river has to a considerable extent influenced our decision, because we wanted, as part of the context of the exhibition, to get people out of the gallery and perhaps inspire them to a spontaneous summer swim. It was also possible to hire a motor boat and look at Childhood Dream closely without having to swim. Part of the project was also a big-scale photograph by Juraj Kammer documenting the floating of the unusual vessels from the year 1985. The reconstruction itself also ran in a community spirit. We had to reprint one photograph as the original wasn't preserved. Our friends in Krakow helped us with that. Roman Babjak and Michal Moravcik planned and carried out, according to the documentation, the construction of the vessel. 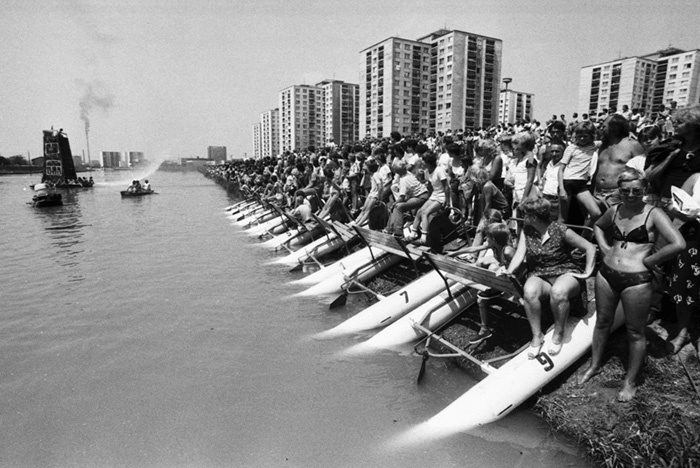 The water bicycle was arranged by Dusan Zahoransky. 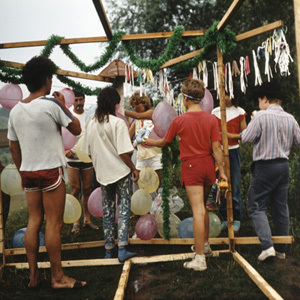 Participating in the performance and documentation on the day of the opening was: Lucia Nimcova, Jana Kapelova, Mira Gaberova, Michal Moravcik, Roman Babjak and Pista Bunganic. Will Childhood Dream float towards the ocean in twenty years time? Or will the ocean swim towards Childhood Dream?